Please feel welcome to send your experiences and pictures to the Forester's mail-box. It is possible they will show up here! I am looking forward every time my customers take the time to write and tell about using their new rifle stick. Again I have had beautiful pictures - like these from Denmark. Here there is Torben R who has photographed. Beautiful six pointer is investigated. This rifle stick has only been oiled. "The rifle stick has arrived today, in perfect condition and just as wonderful as i could have ever wished for!! well done again a first class design. 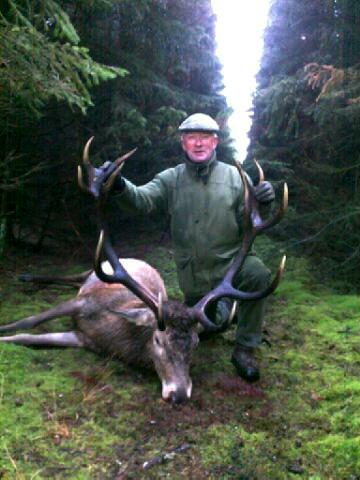 A very good friend and a skilled hunter has been in Scotland with a good result. 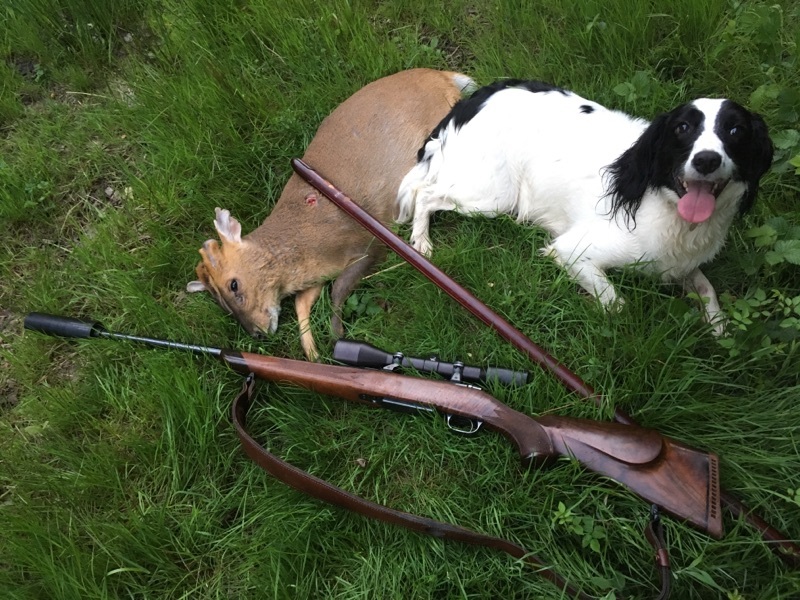 I recieve some wonderful photos from my customers - I do not know who is the happiest - the dog or the owner of his new rifle stick? "...However, I wanted you to know that my rifle stick arrived safe and sound on Saturday past. To say that I am pleased with it is an understatement. It’s even better than I envisaged. I can’t wait for my first outing at the deer with it. I’ll send you some images when I manage to put it to good use. Thank you so much for your efforts on the stick. It’s very much appreciated. Once again. Many thanks for my stick. So pleased. 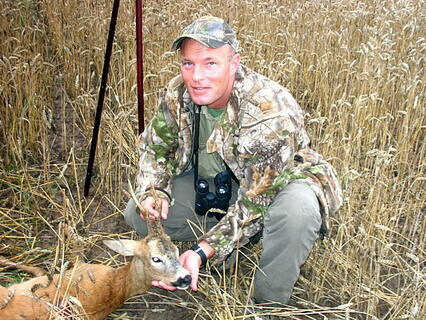 "I have forgotten when I got the rifle stick, but it has been my silent witness to all hunting trips ever since. It has really been used for many things - exept what it is designed for. 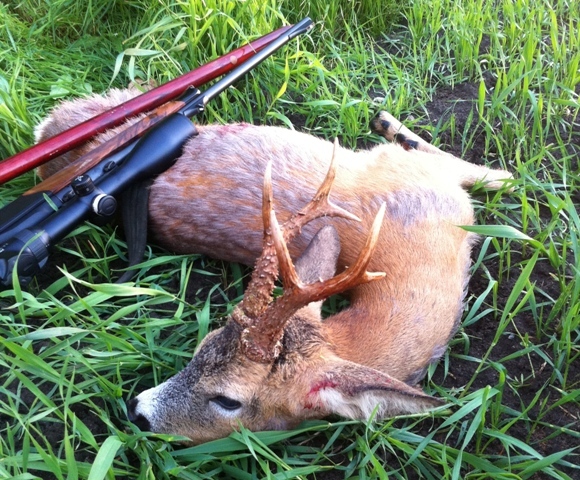 On September 1, 2014 it was used as intended and the result was my first stag. THANK YOU! for a great and utmost use product that always gets praise and attention when spotted. I got this nice photo from a happy French customer, who had been to Hungaria! 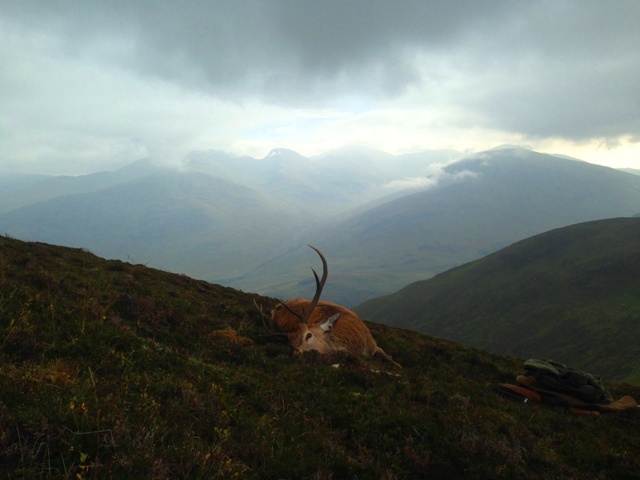 I was very happy to receive this beautiful photo from Scotland - Must be wonderful - and exhausting to hunt there! 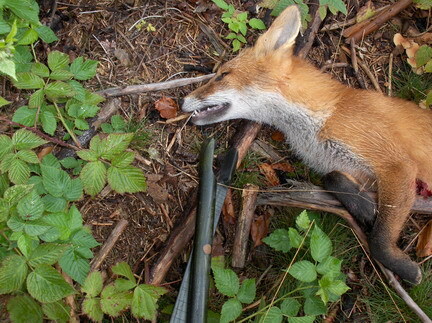 Here is a photo from my first kill with help from the superb rifle stick you have made for me! causing great damage to the grapes used for our famous "rosé" wine. Once again - thank you for the wonderful rifle stick! "A couple of photos for you in thanks for the wonderful craftsmanship on the sticks. I feel properly equipped!!" From K.H. 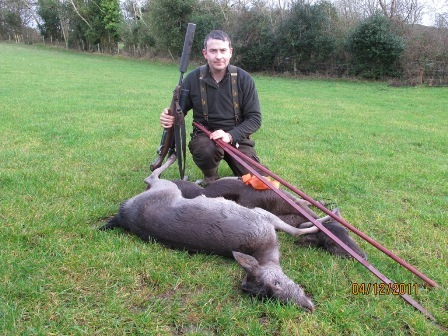 who lives in Ireland, I have just received 2 great photos of his succesful hunting of doe with the aid from his rifle stick from 2009. A rifle stick that has been used a lot. 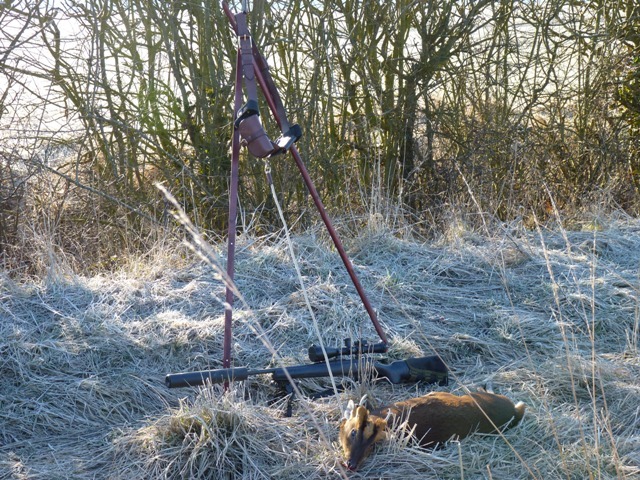 "The best stalking stick I have ever come across"
It was certainly contributing to that after 24 hours of stalking I got my dream roe buck at 220 yards. " A nice buck. 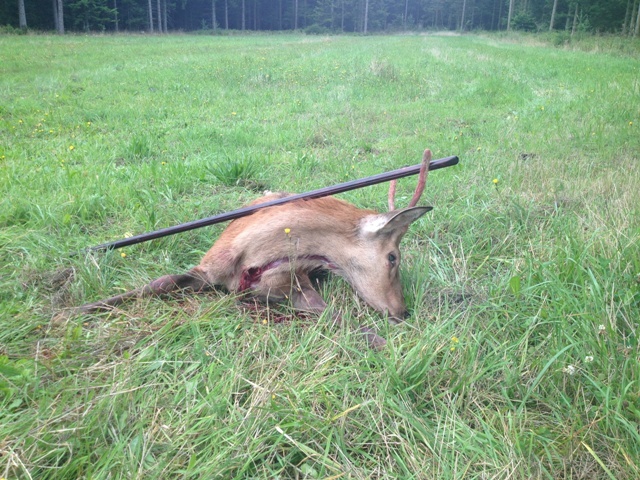 240 yards is a very long distance to an unharmed roe deer - even with the rifle stick and support for your back. 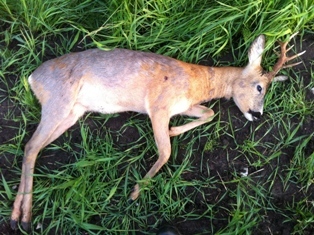 Here is a few photos of the Roebuck. The stick holds high class. 137 yards and a perfect bullet. I found the missing stick. Now my father has borrowed it and he is very satisfied. The little short one you made for me, to use for the fallow deer works excellent, as a matter of fact I was without any luck last year not getting any deer, but I saw some very big one's and it was a CLOSE call. It is almost as enjoyable. Very nice shot at 137 yards. Congratulations! I already found great pleasure in using your rifle stick. ... Finally, they are approx. 120 meters away and approaching the boundary willow fence. It's now or never. Should I shoot? 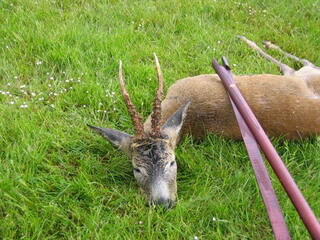 It is a bit far - and this is my first rifle shot - to the first Roe buck, - on the very first day of the season! At last I realise that it is now or never and that kick starts the buck fever. The heart beats wildly. I am however reassured by the fact that my aim is calm. The new rifle stick works well. I fire upon the target. The buck jumps up in the air and runs into willow fence. The Does runs to the other side. Wow, a pulse! After approx. 5 min. I proceed towards the the spot where the animal was hit. I find no blood. I'm looking in a semicircle up against the fence, 20 meters away. 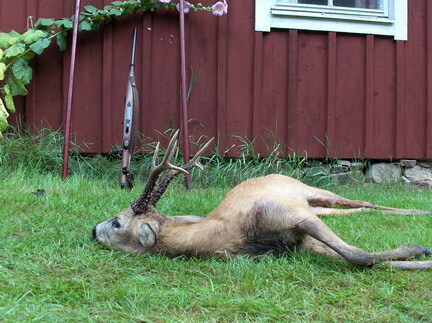 There, the buck lies against a tree, in the boundary towards the neighbor. It is absolutely unreal. One thing is, that my buddy shoot a buck the same morning. But that I did it as well on my first rifle and buck hunt. That is completely unbelievable! " 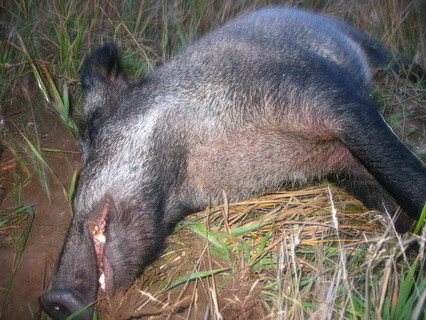 Here is a picture of a boar we just shot and Johan's 8 months old "Jamthund" (Swedish elkhound) who tracked it. 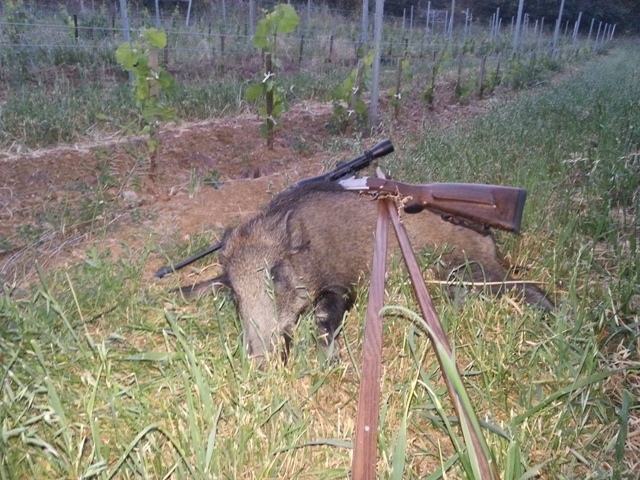 We have now shot 3 boars in two weeks wich gives here an optimal start. 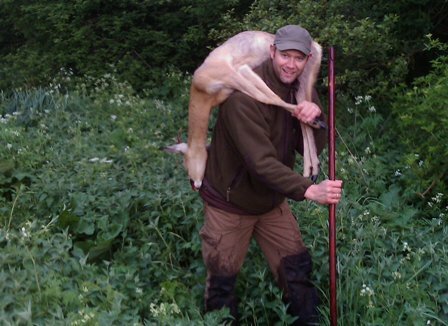 Kalle and Johan, Sweden 2010"
my rifle stick and it is always with me whenever I go Stalking. I had some luck last week and have attached a photo for you to look at. "At Iast I got the rifle stick's in my hand and I just long for the weekend when I can test them. They are very nice, even more beautiful than I had dared to hope and I am so happy. 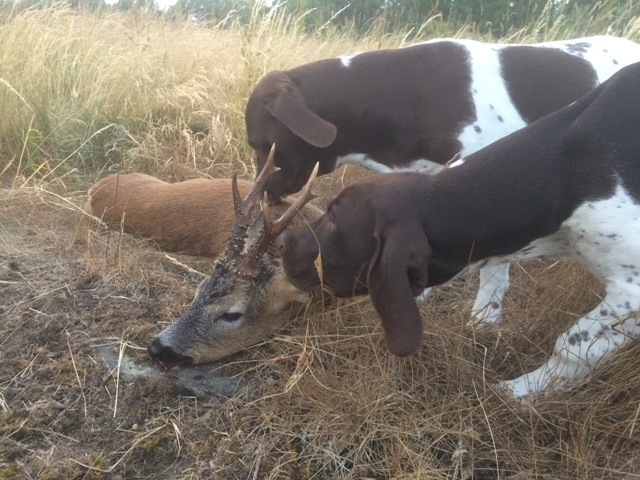 It is a joy to see them and I will recommend my hunting partners to obtain their own. Thank's for the fancy rifle stick, a Christmas gift from my parents. 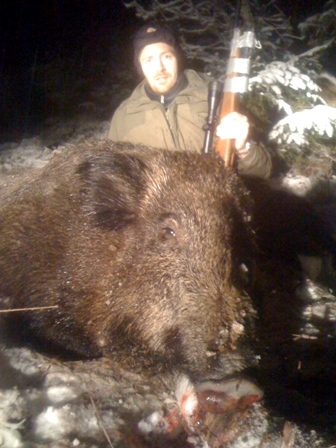 It has allready been in use between Christmas and New Years Eve in Sweden, were I got this 320 pounds boar. The first rifle stick in Ireland got a tremendous start! 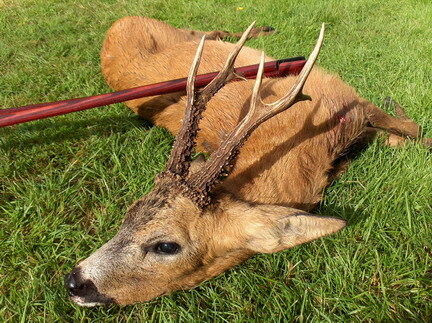 KH shot 4 Fallow deer with the aid of the Forester's rifle stick. 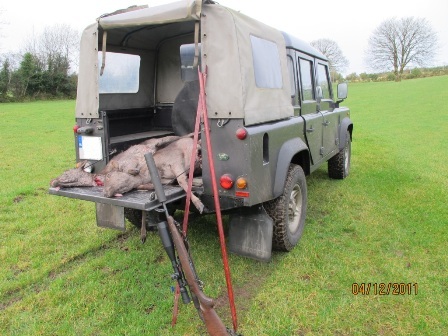 i was hunting Fallow deer in County Tipperary. the sticks worked very well. it will take me some time to get quick with them." One of my customers lost his rifle stick in Poland. He came by the other day and fetched his rifle stick no. 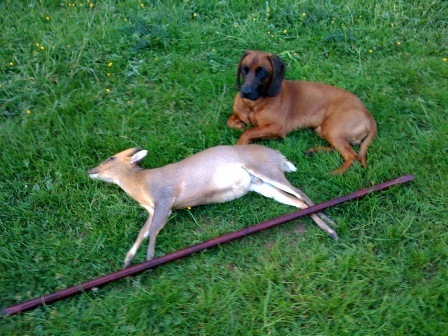 2 and showed me his new puppy and this beautiful roe buck trophy, which he got with the help from his old stick. I just wanted to say that the stick is excellent. I am very satisfied!!! May I wish you a pleasant autumn and a good hunting season with many good experiences!!! Best regards, Gunnar. Denmark 2009"
The stick arrived safe and sound. 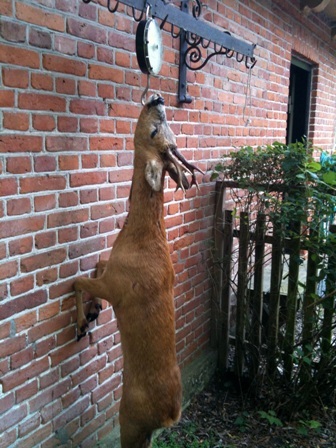 Shot a Muntjac on the Saturday evening. once again thank's for the rifle stick. Forwarding a photo of my first prey with this stick. both deer, buck's and wild boars on its conscience. 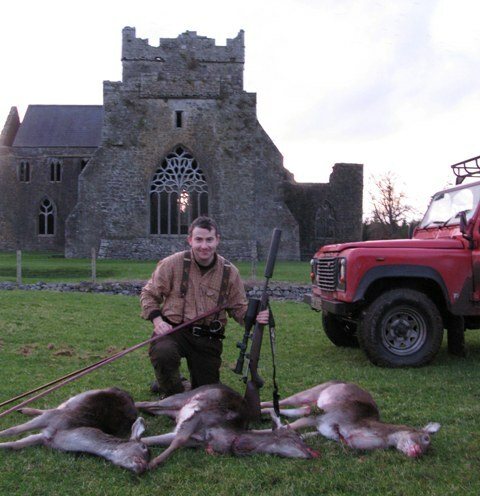 "Appart from the use of the rifle stick to a few roe buck's, I had it with me in Scotland on deer hunting. 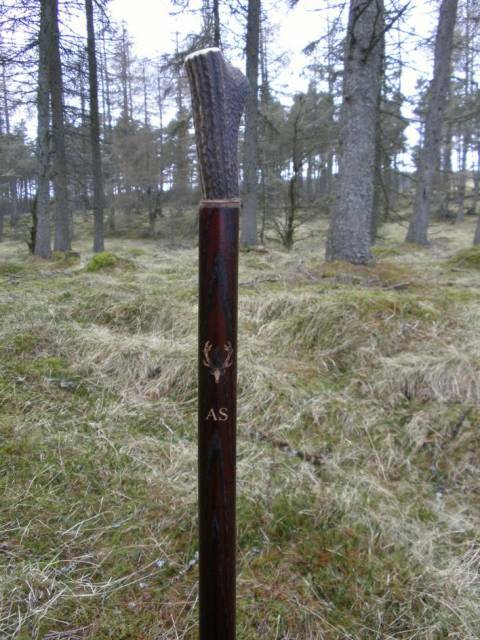 Here I got my first stag in the highlands, but it is also indispensable as a walking stick. Every one who has been to the highlands would agree, that one can not do without "the third leg". 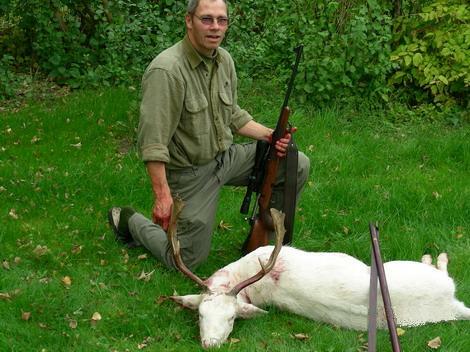 Søren K. Denmark 2009 "
"Dear Forester, a few years ago I recieved my fine rifle stick. You invited me to send a picture... and here it is. both mornings and evenings... It has been great fun. Thank you for the beautiful rifle stick. I will need more stick's as birthday gifts. 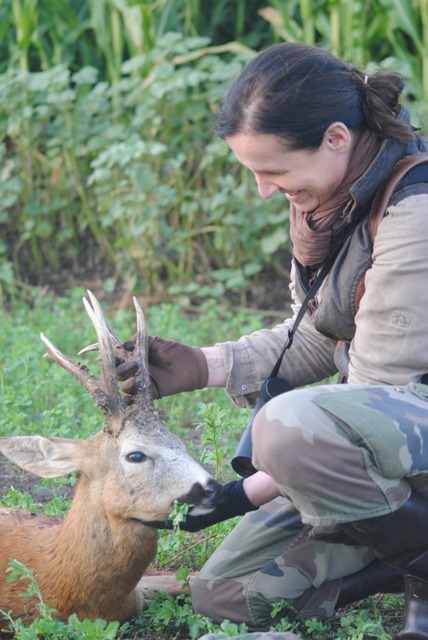 The roe deer antler looks very nice, and soon I will use the stick every day in the rut. And may I wish you a good hunting season! 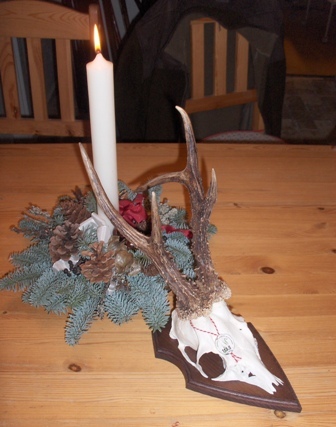 "This calm moose sneaked in from behind on one of my hunting trips to Sweden! I had decided not to shoot, so I used my camera instead. "I have shot more than 300 rabbits with the aid of the rifle stick. 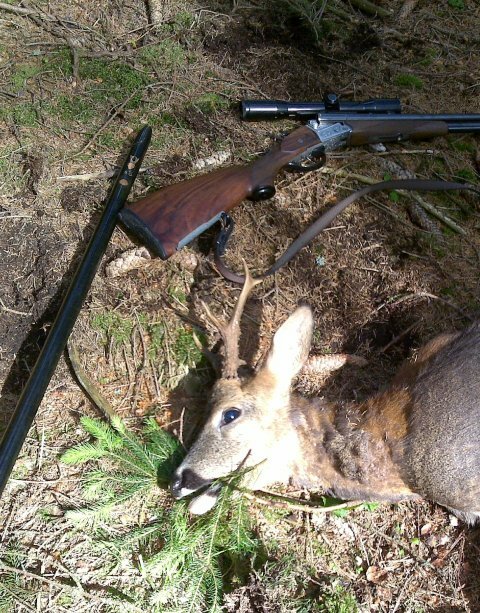 Swedish hunter 2008"
"The rifle stick had a fine debut and contributed to five good roe buck's - all hit in the shoulder... I have tried several rifle sticks before--both my own and others--and this one is genial. Brilliant thought out and very fine made; it is a pleasure just to sit admiring and feel it between one's fingers. Today I received my rifle stick. It was not as nice as I thought it would be, but much, much more beautiful. Once again accept my praise for this very beautiful handicraft. Among my hunting equipment, this item will be especially looked after. Best regards René N. Denmark 2008." "Thank you for the rifle stick. 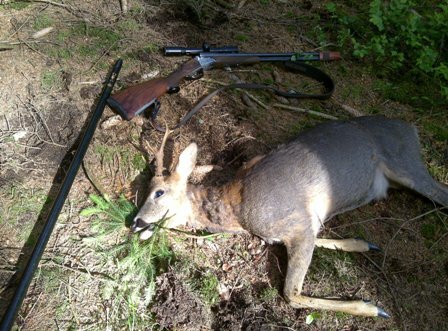 It was properly introduced when I got 4 roe deer with 4 perfect bullets in the last days of the hunting season. Something I know you will understand and appreciate. Regards, Hans E. Denmark 2008"
"Just to let you know that I am very happy indeed with the stick you sent me. 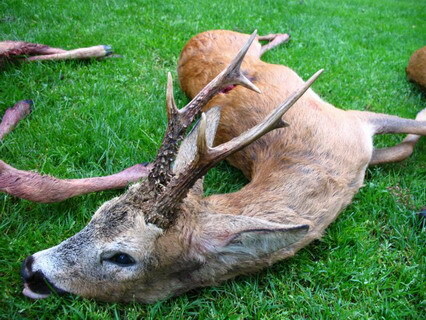 It has killed twice so far (1 x Muntjac Buck and 1 x Fallow Doe) but I am afraid that I forgot my camera on both occasions so can send you no evidence yet! "Can you imagine, the first time with the rifle stick I got a fallow at 150 yards with the aid of the stick, when the palm stood still for a few seconds. Bulls eye. Could never have done it without the rifle stick! From the far north there has been reported that a moose has been shot at 160 yards with the aid of the forester's rifle stick. Norway 2007. 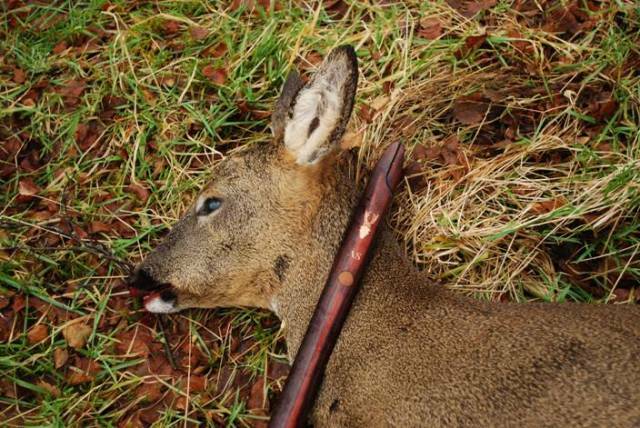 "Perhaps the biggest roe buck shot with the aid of the forester's rifle stick? Sweden 2007." 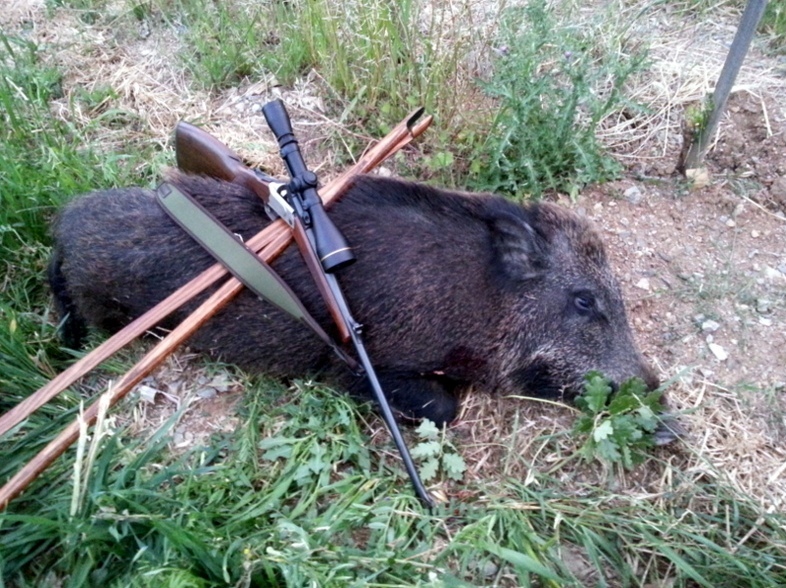 "He stopped in the grain and I got the rifle on top of the rifle stick. He stood perfectly, showing the whole side of the body. No trembling no hitch, only one precise shot. Bang... He run 5 yards and fell down. 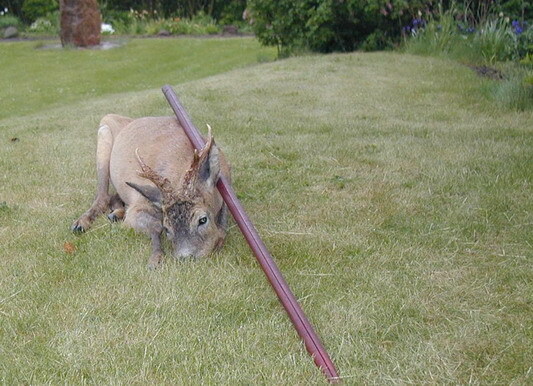 Morten in Sweden 2007"
"The rifle stick is also excellent as support when stalking without being seen or heard." "...I have used it diligently. Here are some pictures. shows where the white fallow met the Forester's rifle stick. 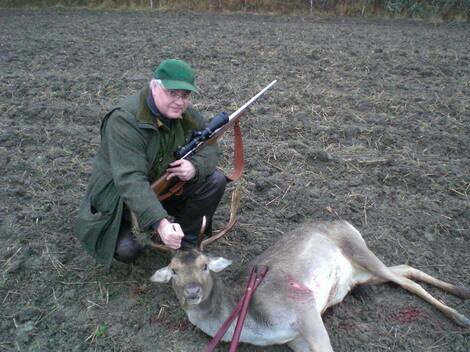 Regards from, Poul V. Denmark"
"...here I had my first good experience with your rifle stick. I was stalking through the wood and reached a clearing, which I studied with my binoculars. Suddenly I saw a deer 130 yards away, which normally is to far for me to shoot at freehand. 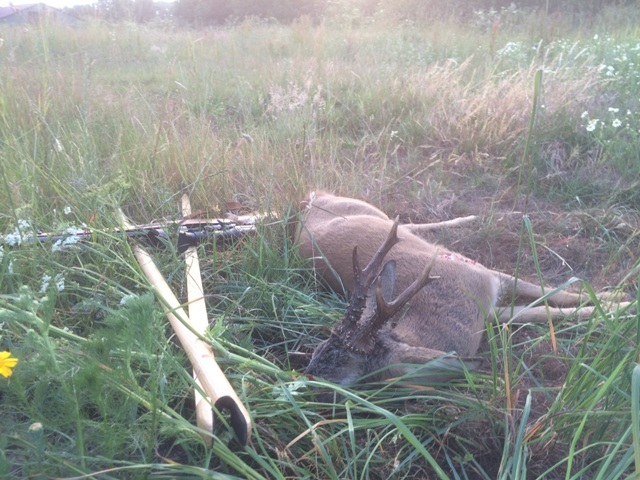 I opend the legs of the bipod with one hand and with the other I got the rifle up in the fork, ready to shoot. I aimed at the deer, and I was ready. 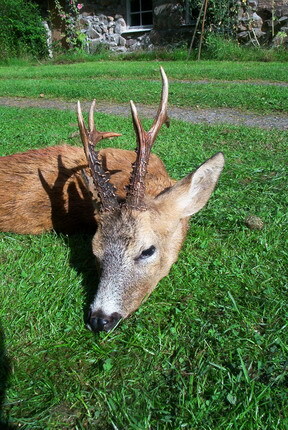 As soon as the head was lifted up and I could see it was a mature buck I fired and the roe deer went down. 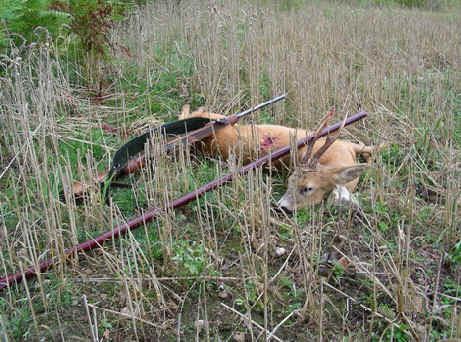 The twitching legs showed that it was hit properly and surely, the buck lay there with a good bullet. So the wooden bipod works :-) Jesper. Denmark "
shot on the 17th of May, 2007, and my indispensable rifle stick. I bought it from you in 2006. Yours truly, Finn J. Denmark"
"...suddenly they run towards me at 160 yards and the roebuck starts to feed. That was a fatal fault. I had placed my Weatherby .300 (with a Barnes MRX 180 grains cobber bullet, 1082 Yd/s) onto the bipod. 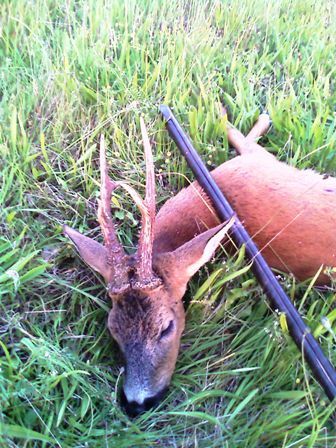 I had a clear shot and squeezed the trigger harder and harder until the shot went and the buck fell dead to the ground... K. Pedersen, Denmark." 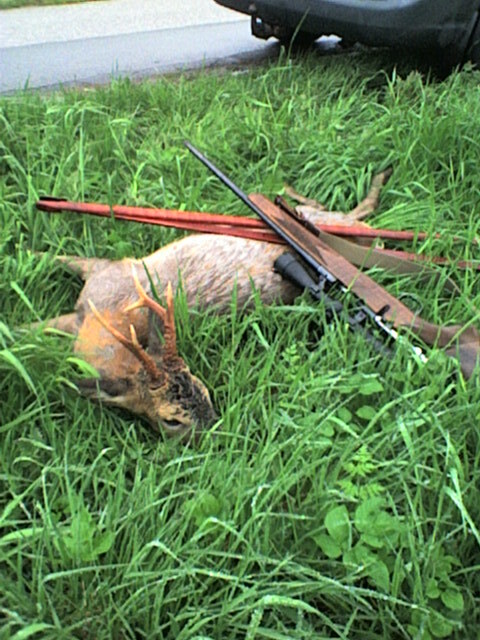 "The first evening I met the roebuck on the picture... and at last I succeeded to shoot a roebuck with the aid of the rifle stick. And it is a true pleasure to use the bipod... I tried the idea to squeeze - and it works optimally! My rifle lies perfectly in the U-shaped rubber lining. - so I really am looking forward to this years stalking season!